Bone and joint health are nutritionally complex [1-3]. Many Food nutrients, other than simply calcium, are required for proper bone and joint health [1-4]. Manganese deficiency can contribute to disorders of calcium metabolism and can cause skeletal abnormalities . Boron deficiency can lead to a weakening of bone composition, structure, and strength . Vitamin D is involved in bone formation and the calcium metabolism. Vitamin C is involved in collagen formation, which is necessary for joint health; it also improves the absorption of calcium . Vitamin K, boron, copper, phosphorus, and potassium also help the body retain calcium . Considered to be non-essential until 1972, silicon has an important role in bone and cartilage collagen biosynthesis and “is involved in the organic phase in the series of events leading to calcification” (plus it is necessary for healthy bones, skin, hair, and nails) . Research shows that Food nutrients are better than isolated USP vitamins [e.g. 5-7] or inorganic mineral salts or mineral chelates [e.g. 8-9]. Consumption of isolated calcium is unnatural and is why many feel that calcium needs to be taken with magnesium, vitamin D, phosphorus, and other nutrients which are in Food Cal-Mag Complex (also, factors other than calcium help work with calcium to prevent osteoporosis [1-3]). Research has shown that there are low incidences of osteoporosis in cultures where people consume 300 mgs of Food calcium per day or less from vegetable sources, [2-3] (Food Cal-Mag Complex is a vegetable source of calcium). This appears to be because the other, non-calcium, nutrients in plants play important roles in bone development [1-4]. Interestingly, though the consumption of vegetables and fruits is positively correlated with increasing bone density [2-4], mainstream research has concluded “No similar trends were found with past intake of milk or milk products” . Food Cal-Mag Complex contains vegetables and fruit/s, but no rocks, milk, or milk products. Food Nutrient Compared to USP/Mineral Salt? Vitamin C Up to 15.6 times antioxidant effect . Vitamin D Over 10 times the antirachitic effect . 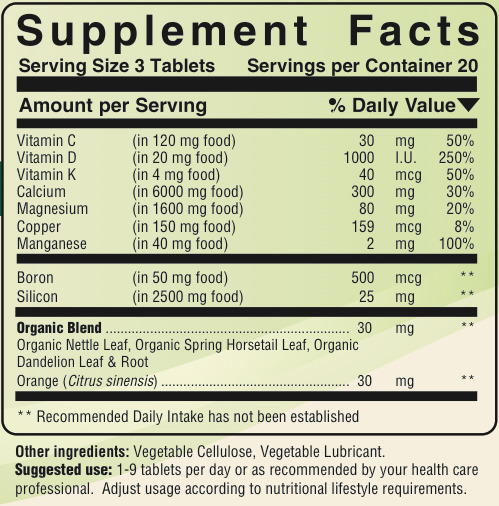 Vitamin K Safer than vitamin K-3 menadione . Boron Organic, not inorganic, form . Calcium 7 times as effective in raising serum ionic calcium levels . Copper Organic, not inorganic form . Magnesium Better absorbed and retained . Manganese Organic, not inorganic, form . Phosphorus Organic, not inorganic, form . Potassium Organic, not inorganic, form . Silicon Organic, better absorbed, form . Often we attempt to meet our mineral requirements through consuming processed rocks known as mineral salts. But most nutrition experts believe that nutrient dense foods are the best way to acquire needed minerals [1,12]. Water thyme (Hydrilla verticillata) is the most mineral dense Food known--and the water thyme (and the other plants) in Food Cal-Mag Complex is harvested around the peak of its mineral density for maximum nutrient content. Many ‘natural’ products contain inorganic mineral salts instead of Food. These mineral salts are actually inorganic industrial rocks, whose primary use is not human nutrition. Calcium carbonate and silicon dioxide for example are used to manufacture glass, abrasives, and ceramics . Nearly all inorganic ‘magnesium salts’ have a laxative or carthatic affect on the body , thus do not seem to be suitable for optimal human nutrition . Magnesium oxide, which is used in certain cements , does have not complexed magnesium--complexed magnesium is thankfully better absorbed  (foods, of course, contain complexed magnesium ) . Manganese sulfate is used to make red dye . Boric acid and sodium borate (boron ‘rocks’) are used for weatherproofing wood, as a preservative, in the manufacture of cements and glass, as well as for cockroach control . Copper sulfate is used as a drain cleaner. Manganese carbonate is used as a whitener as well as for a drier for varnishes . Should you recommend that your clients consume such things? Foods contain many other substances which can affect bone and joint health, such as trace minerals and the enzyme superoxide dismutase (S.O.D.). S.O.D. appears to reduce articular cartilage damage associated with osteoarthritis . Food sources of silicon appear to be much better absorbed than silicon salts, such as silicate additives . Food vitamin D has antirachitic effects, yet the first USP form developed did not . One study found that consumption of Food calcium raised serum ionic calcium levels by 7 points, while a non-food form did not ; raising serum ionic levels has been shown to reduce high blood pressure [9,16]. The question is, since humans do not absorb minerals in rock form such as plants do (this is one of the most basic ways that plants and humans differ ), should humans swallow rocks processed with various acids for their mineral needs or consume natural mineral as they are found in plants? Interestingly in 1999 the Nobel prize in medicine was awarded for the finding that humans need protein chaperones in order for minerals to be absorbed into the cell. Calcium and magnesium mineral salts do not contain protein chaperones, yet Food Cal-Mag Complex naturally contains protein chaperones such as ceruloplasmin and ATX1 [18,19]. 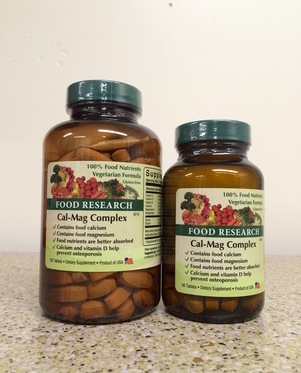 Thus being non-foods, typical ‘cal-mag’ formulas are truly inferior to Food Cal-Mag Complex. Since all its nutrients are in plants, Food Cal-Mag Complex contains minerals as they are found in plants, which are chemically not the same as industrial mineral salts. Unlike humans, plants actually have the ability to decrease the toxicity of compounds by changing their biochemical forms . Plants are intended to ingest rocks, humans are not. Therefore, assuming your clients are humans and not plants, Food Cal-Mag Complexis the premier choice of doctors truly interested in natural health for long-term supplementation.